Hydraulic Shear is suitable for various operations, including breaking the steel structure, scrap steel processing and other applications, cut iron material, steel, tank and tube etc, unique design and innovative ways to ensure the efficient operation and powerful cutting force, than ordinary hydraulic shear performance beyond 15% . -Jaw size and special blade desigh to increase productivity. All hydraulic shears series can quick and convenient to replace the blade, can reduce machine downtime and optimize productivity. 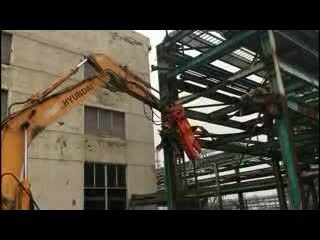 Wuxi BeiYi Excavator Parts Factory.